First: The print version of Swiftly Beats the Heart is now available to purchase on CreateSpace by clicking here. It will also be available soon from Amazon.com (but I make a little more if you buy it direct from CreateSpace). I know there are some of you that are unable to read the Kindle Version. I hope you will pick this up and let me know what you think. Second: Yesterday I received a request for a partial of Amulet of the Fallen God from one of the literary agents I queried. Of course it’s not a sure thing, but it is the first step in getting a new agent for my writing. Also, this was a well respected agency, who represent some awesome authors, with many books on the best sellers lists. I sure hope they like what they see. Third: I am moving ahead on a deal that will possibly make Spanish & French translations and Audio books available for Swiftly Beats the Heart and any future self-published books. There is so much happening right now, and it’s all very exciting. For the first time in my life, I think, I’m really looking forward to going to work each day. Amulet of the Fallen God is complete and extensively edited, which means it query time. I have been planning on using this novel to search for a new agent, so it is once again time to cast a wide net and see if I can get any nibbles. I’m really happy with the way the novel came out. It’s 99,040 words and has a lot of action and romance. It’s a fantasy with romance elements. It’s not a romance because I just couldn’t get Allsa and Dravious together at the end for a ‘happy ever after’ ending. It will probably happen in a sequel, but there was a a small roadblock at the end of the book that needed to be there for the right ending of this part of their story. I’m very happy with the initial results for Swiftly beats the Heart. Lots of copies were downloaded during the FREE promotion, and I’ve also had a few sales for real money. I just received the proof for the print edition today, and I am hoping to have that available soon for those of you without the ability to read the kindle ebook version.I’m also hoping to get some reviews on Amazon and GoodReads to help create new interest. It’s still amazing to me that so many people are reading my story. There is so much to do. I am now planning on my next release. I’m going to try and release my Demon Gate series. First will come There’s no such thing as Werewolves and I hope to have it ready to upload by the middle of next month sometime. That will be followed by Templars Gate and after that Demons of Dusk. I still need to finish writing the last book, and give the first two a really good edit run. Then there’s covers and formatting. It’s a lot of work, but I have to admit…I’ve never been happier. Okay, it’s no longer free, but it’s still just $1.99. Well it’s done. Swiftly Beats the Heart is now available on kindle from Amazon. For some reason the wrong cover is showing, but I’m not concerned. It took me three attempts at publishing it and this was the original cover I uploaded, so I’m hoping it fixes itself over time. The right cover displays when you look inside. Click here for a link to it. But wait until tomorrow to order it and it will be Free!!! While waiting for the kindle version to publish I started playing around with Createspace. It turned out to be incredibly easy to navigate so I will also have a print version of Swiftly Beats the Heart available soon as well, for anyone wanting to read the book who doesn’t have the ability to read the kindle version, or just likes to hold a real book in their hands. I just ordered the proof of the book and it should be in my hands on Wednesday. It’s hard to imagine, and I am so looking forward to it. I’ll let you all know when it’s available. Testing the waters by jumping in on the deep end. I’m a member of two awesome writing groups – Writers Voice, associated with the Wisconsin Writers Association, and the Wisconsin Romance Writers of America (Wausau Chapter). I can’t express enough how much these two groups have helped me and my writing. Recently we’ve had a lot of discussion in both groups about self-publishing. Now, I’ve always planned to try and go the traditional route with my writing – get an agent and let them handle sales and whatnot so I can just ‘write.’ But I have been wondering lately if maybe I’m not missing the boat on this new dynamic in publishing. So, after an interesting discussion at my Wednesday evening Writers Voice meeting (Thanks Sherrill) I decided to look into Kindle Direct Publishing. After playing around with it for less than a day I was suddenly at the point of…Wow, I could do this!! So I did it. 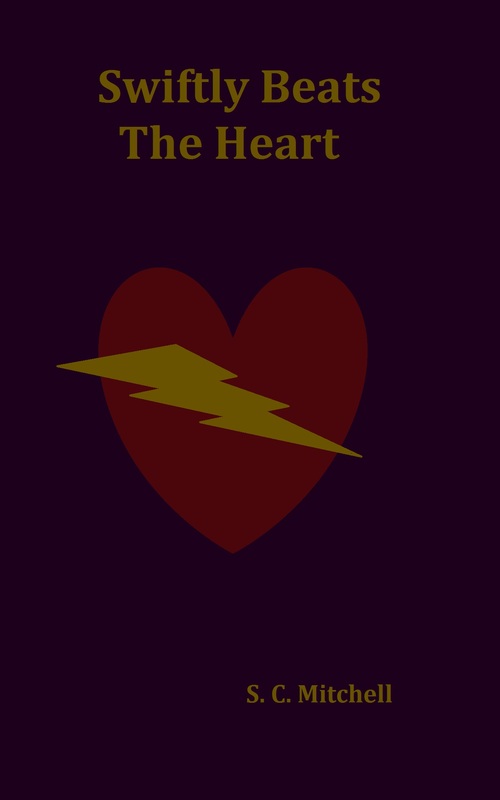 I am happy to announce that Swiftly Beats the Heart (formerly titled Cheetah and Zoom) will soon be available for purchase on Amazon.com. It’s still ‘under review’ and though they say this should only take 12 hours it has taken much longer than that. I will post a link here as soon as it goes up. I plan on doing the kdp select thing and put it up for free for 5 days, just as soon as I figure out how to do that. Yeah, the cover is not the greatest, I made it in MS Draw, but I think it works well enough for a first attempt. I feel the story is solid and a lot of fun, so I hope you’ll pick it up and let me know what you think. I still do plan on looking for a new agent, and pursuing the traditional route to publishing, but even us old guys need to keep our eyes on the future and for me, yesterday was a step in that direction.